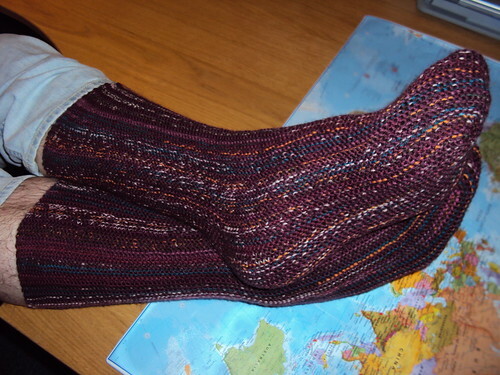 It took a while, but my April socks are finally done, albeit in the middle of May. 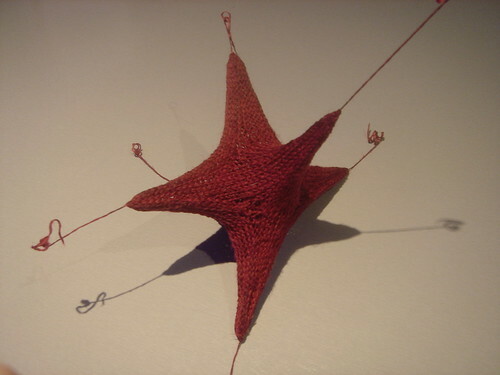 First time you saw these it was as a curl of 240-odd stitches on a too-small cable-needle. Then I wondered if the effect I was getting, with the yarn choices I’d made, was right for the construction method of the project. Mottled-effect: more Matrix than Mousetrap! 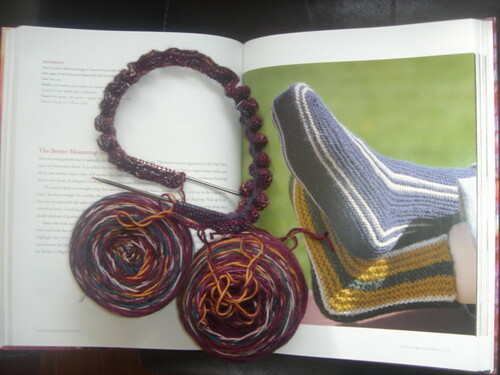 After much deliberation – and knitting one half of the sock – I opted to de-ply the yarn I had double-stranded and re-wind it so that I could make the second half in alternate stripes of variagated and solid. DH declared it to be a Wampum Belt but, for me, this project was the sock-equivalent of the Baby Surprise Jacket – only you know that it’s a pair of socks. More importantly, you don’t know that it’s really going to fit until you sew it up. 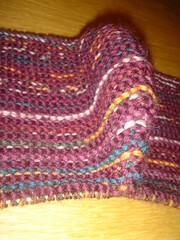 The project had a different surprise in store for me, however: I ran out of yarn 10 rows before the end. Sock Surprise; now with added surprises! 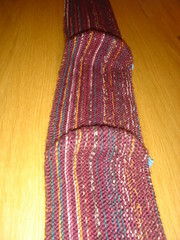 I was quite daunted by the idea of grafting the 200-odd stitches on the seams – four times over! However, Debbie New describes a Super-simple grafting method that helped me get the job done without fear or stress. They fit; he likes them; I'm happy! 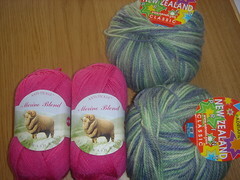 These two balls /skeins of yarn were each intended to make a hat as a gift for Christmas. The problem was, I only had time for one of them. a) the Merino Blend Anti-tickle in pink for a lacy berret for a co-worker and fellow knitter; who would appreciate the effort – and to whom I feel endebted because of her friendship and support through-out the past year? b) the New Zealand Print Classic in blends of green and blue for my Sister; who is also a fellow knitter, would appreciate the effort – and to whom I feel endebted because of her friendship and support through-out the past year? Yes, it wasn’t an easy one. 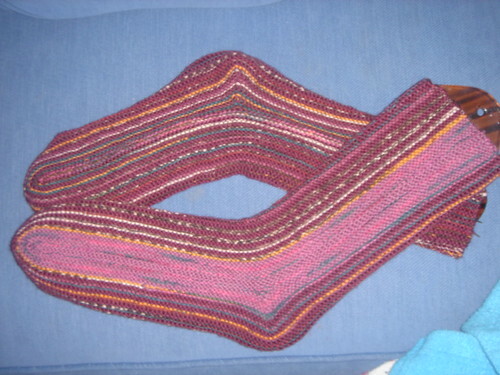 In the end, the choice was made for me – by the afore-mentioned co-worker / knitter friend. I had shown her the purple star that I had made for Averil (thankfully, I can reveal this now as she’s just told me that she got it). But she thought I’d made it for the Charity Sale-of-Work and wanted to buy it. Easy peasy choice for me: Star now, Hat later. 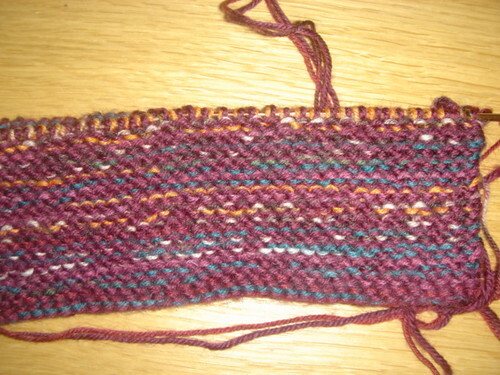 You’ll have to wait until Wednesday’s WIP Pawade to see the hat I started for my sister last night – don’t be greedy!